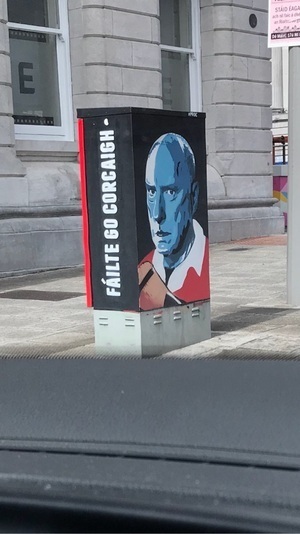 Tribute in Cork city to Alf Stewart from Home and Away, who is not so well known for his hurling skills. Name that actual hurler. Anyone? 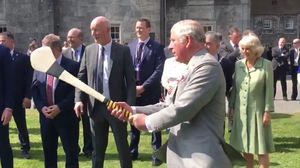 Posted in Art/Craft, Sports and tagged Cork, Hurling at 9:42 am on July 18, 2018 by Chompsky. When wall-to-wall GAA coverage is simply not enough. Posted in Misc and tagged Hurling, RTE at 4:51 pm on July 16, 2018 by Bodger. 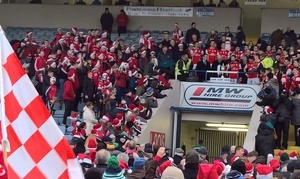 The last time I was at a Cuala match in Portlaoise was 25 years ago. That year (1991), a great crop of Dalkey, County Dublin hurlers had won their second hurling championship in 3 years, but were beaten by a strong Birr team in the semi-final. It was 21 years before Cuala won another Dublin hurling championship (2015). They repeated it this year and yesterday went on to add their first Leinster title to it. I can’t tell you how happy I felt to see members of the 1991 team back on the same pitch, celebrating the win with the players. John Treacy, Karl Schutte and Maurice O Callaghan were part of the squad back then. Yesterday, each of those 3 had two sons on the winning team (David Treacy, Sean Treacy, Mark Schutte, Paul Schutte, Con O’Callaghan and Cian O’Callaghan). It’s also worth mentioning that the Schutte’s are nephews of Vinnie, Mick and PJ Holden who served the club so admirably back in the day. Winning this Leinster title is the result of generations of endeavour. 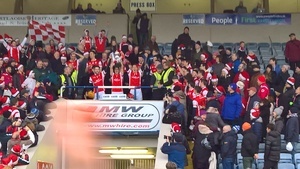 It’s richly deserved and to be enjoyed by a great young Cuala team. We’re very proud. 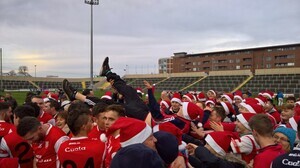 Posted in Misc and tagged cuala gaa, Hurling at 10:22 am on December 5, 2016 by Aaron McAllorum. On the River Liffey in Dublin. 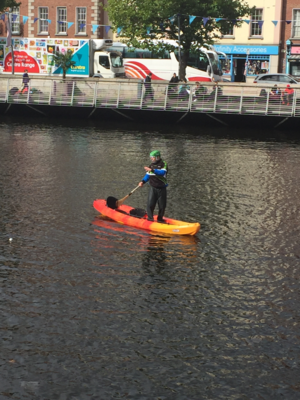 Guy in a canoe, with a helmet and hurl pucking sliotars. Being photographed for something? Posted in Misc and tagged canoe, Hurling, River Liffey at 4:49 pm on October 3, 2016 by Broadsheet. So the four men who won the GAA’s regional hurling Poc Fada were given a ski trip by Topflight. In fact the ski trip they won is the Topflight Today FM Annual Ski Trip. 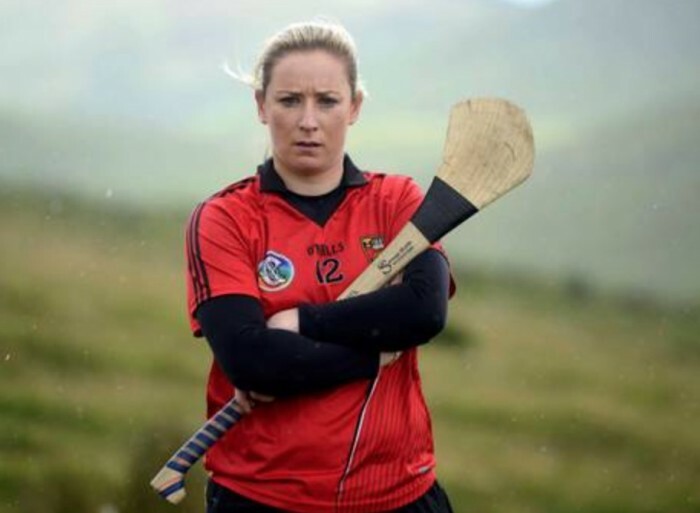 Four women who won the camogie Poc Fada got a medal. The Poc Fada final is on this Saturday so we’ve a campaign targeting Topflight’s MD Tony Collins asking him to offer the same prize to the women. All people have to do is add their name. 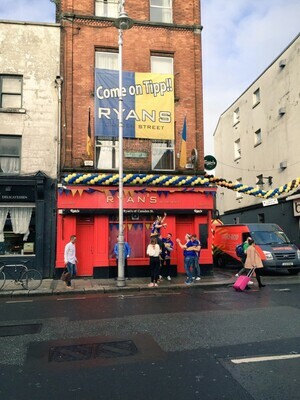 Posted in Politics, Sports and tagged Hurling, Sexism at 4:55 pm on July 28, 2015 by Broadsheet. Posted in Sports and tagged Football, Hurling at 10:52 am on April 9, 2015 by Broadsheet. 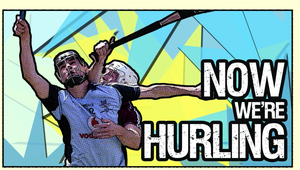 Episode two of a three-part series, Now We’re Hurling, by Dublin Community Television which follows Kilkenny MC and hurling enthusiast Captain Moonlight around Dublin as he investigates the rise in interest and quality in both hurling and hip hop in the capital. Would be lovely to get more eyes on this if ye fancy having a look at it. Some great insights on the beautiful game, an intercounty hurler being put through his paces in Ballymun, some quality raps and an ad that takes the form of a silent movie made by Crumlin GAA members. Posted in Misc and tagged Dublin Community Television, hip hop, Hurling at 11:50 am on September 8, 2014 by Broadsheet. @AnalysisGAA I hear Kilkenny will be tough to beat in the form they are in. He’s far too handsome for hurling anyway. Posted in Sports and tagged All Blacks, all-ireland final, Hurling, kiwis, rugby at 9:56 am on September 7, 2014 by Aaron McAllorum.